* Classic Mimosa starts with a strong violet, surrounded with a haze of citrus. * The fragrance is clearly named for the mimosa flower, not the drink. * As the citrus burns off, a subtle dry rose joins the violet, along with a slightly honeyed fruit. * The thing is, I can’t place which fruit it is – I am thinking it might be mango. 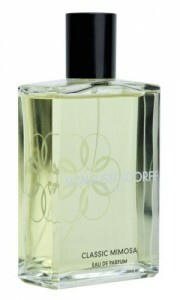 * The violet lightens up a bit as the sweet vanilla and musk of the base take over. Summary: I’ve used the term “old lady” to describe fragrance – and I say that just to distinguish the difference between “old lady” and “classic.” This is a classic-smelling fragrance that you might have smelled something similar to in the past, but here it is quite refined and masterfully-blended. The top notes are slightly brash but not overbearing and calm down into quite a wonderfully smooth blend. I do think the scent is misnamed, as it strikes me more as “Classic Violet” and not “Classic Mimosa,” since the violet stays dominant, at least on my skin, through the development of the scent. Although this is probably aimed as a feminine scent, it is definitely unisex as it would smell amazing on a guy. It’s quite office-friendly because it does feel clean and fresh – but not boring in the way those words usually connote scent. Longevity is excellent, with the base lasting more than eight hours on my skin every time I wear it.